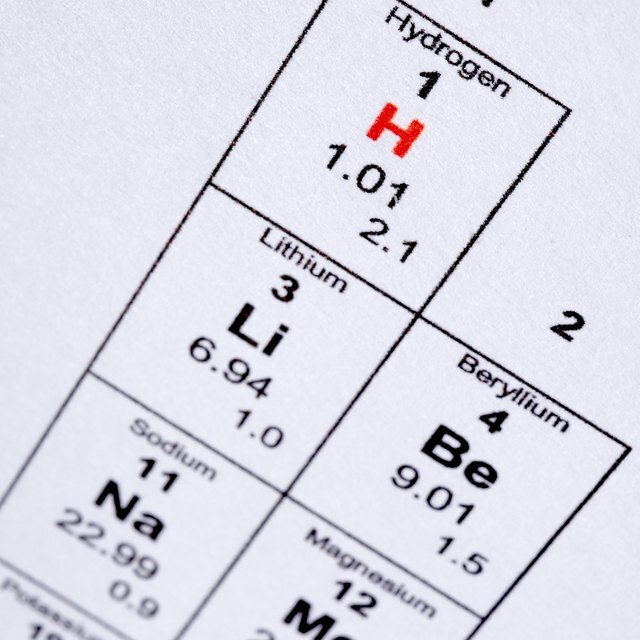 If you want to know the atomic mass of an element, you'll find it listed under the symbol for that element in the periodic table. The units aren't included with the mass, but they are understood to be atomic mass units (AMU) or, more correctly, unified atomic mass units (u). In macroscopic terms, the number in the periodic table also refers to the weight of a mole of the element in grams. A mole equals Avogadro's number of atoms. One AMU is equivalent to 1.66 x 10-24 grams. One gram is equivalent to 6.022 x 1023 AMU. The unified atomic mass unit (u), also known as the Dalton (Da), is the standard unit for atomic and molecular weights in the SI (metric) system of measurement. Both acronyms amu and AMU remain acceptable abbreviations for these units and are commonly used. By definition, 12 AMU is the exact mass of one atom of carbon-12. The nucleus of carbon-12 contains six protons and six neutrons, so 1 AMU is the mass of one nucleon. Electrons are so light that their mass is considered negligible when determining atomic and molecular weights. Chemists measure macroscopic quantities of atoms in units called moles. By definition, a mole is the number of atoms in exactly 12 grams of carbon-12. That number turns out to be Avogadro's number, which is 6.022 x 1023. This creates a relationship between the atomic mass and macroscopic weight of every element. For any element, its atomic mass in AMU is equal to the weight of 1 mole of the element in grams. For example, all natural isotopes of oxygen collectively have an atomic mass of 15.999 AMU, so one mole of oxygen weighs exactly 15.999 grams. Similarly, one mole of hydrogen weighs 1.008 gram, because the collective atomic mass of all isotopes of hydrogen is 1.008 AMU. What Is One AMU in Grams? A mole of carbon-12 atoms weighs 12 grams, and there are 6.022 x 1023 atoms in a mole. Dividing 12 grams by this incredibly large number of atoms tells us that one carbon-12 atom weighs 1.99 x 10-23 grams. Since a carbon atom weighs 12 AMU, one AMU is equivalent to 1.66 x 10-24 grams. Conversely, one gram is equivalent to 6.022 x 1023 AMU, which is Avogadro's number. Deziel, Chris. "How to Convert Grams to AMU." Sciencing, https://sciencing.com/convert-amu-grams-5777385.html. 26 April 2018.